Another week, another change to the Fortnite arsenal. This time around, the battle royale is getting an icy new grenade, which, while unlikely to deal any real damage, is likely to sow havoc in longer conflicts. The new Chiller Grenade showed up earlier today in the ‘message of the day’ screen, which pops up as players load into the game to give them a sneak peek at what to expect in the coming days. The grenade looks a little like a real-life frag grenade with its ring-pull, but the rest of its design is a little more wintry, fashioning the weapon after a deadly snowman’s head. The item’s description reads “give your enemies cold feet with this winter blast,” suggesting that it’ll work in a very similar way to the chiller traps that were introduced to the game last year. Those encase the feet of anyone unfortunate enough to walk over them in ice, causing them to slide chaotically around. 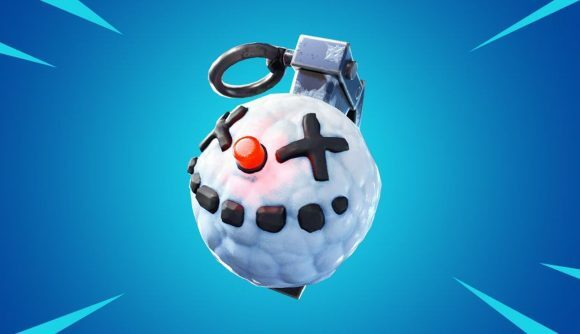 I’d imagine the new grenades will work in a similar manner, but you’ll need to throw them to inflict an icy fate on your opponents. The new weapon strikes me as the first that’s only intended to be introduced to the game for a limited time. While plenty of weapons have seen temporary re-skins for holiday events, and plenty more have been vaulted after their initial releases, I can’t imagine that the Chiller Grenade will stick around into the spring and summer, particularly given its snowman-themed visage. We don’t have a release date for the new item, but given Epic’s regular rapid turnarounds on this sort of thing, I expect we’ll see it added to the game with tomorrow’s 7.3.0 update.